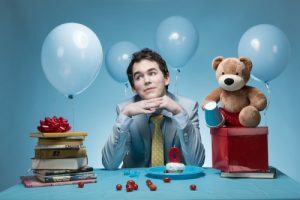 With a sold-out FringeNYC run, two Moth StorySLAM wins, and a book (Alice in Tumblr-land) published by Penguin, Tim Manley is at the top of the storytelling craft. His one-man show, Feelings, weaves together the uneasy years in his twenties when he cycled through relationships and had a difficult time finding peace within himself. Manley is also an accomplished writer, teacher, and artists all of which provide him with material that is touching, funny, and at times heartbreaking; in Feelings, his drawings are projected onto a screen behind him to help us visualize the story he tells. For fans of love, and for those who can’t help but wear their heart on the outside, there will be an additional five performances of Feelings as part of the Fringe Encore Series. How was your FringeNYC experience? This was my first Fringe Festival, and it exceeded my expectations. Everyone who works for Fringe, everyone who was performing, and who came to attend—they were all the loveliest people I’ve ever encountered. It makes me want to do more Fringe Festivals. And I was very pleasantly and happily surprised to be chosen for the Fringe Encore Series. 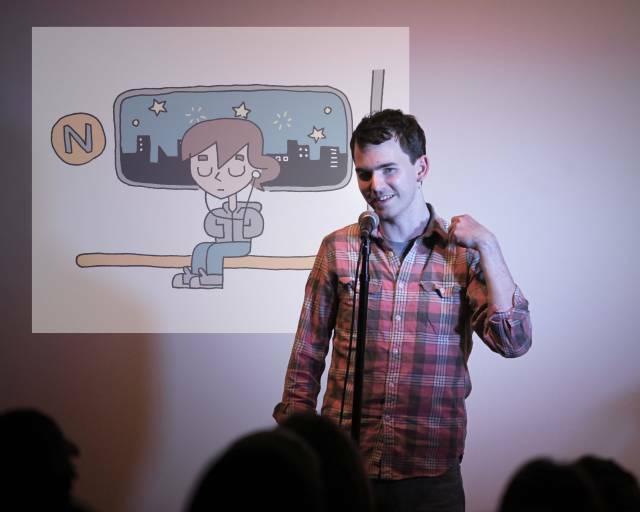 You have a long list of storytelling accomplishments, including a Moth StorySLAM win. How did you get from there to the Fringe Festival? I knew I had a lot of stories that mostly revolved around my dating life in my twenties. I’ve been telling these stories at the Moth, and I see them as all connected. I wanted to have more than five or six minutes so I could get a more in-depth truth to my stories. About ten years ago, I saw Sleepwalk With Me with Mike Birbiglia, and since then I’ve always loved the idea of one person standing on stage telling a story. I knew that there were a handful of solo shows at FringeNYC, so I submitted two of my videos from the Moth and a general outline of my idea. I explained that I wasn’t sure how the pictures and stories would connect to each other, and they accepted me. How did you get connected with your director, Peter Aguero? I’ve seen Peter at the Moth plenty of times, where he is a frequent host, but we really met when we were both on a storytelling tour called The Unchained Tour. We rode together in a Bluebird school bus telling stories all over the South, in used bookstores and small restaurants and other unusual places. That was a little over two years ago, and over time we became friends. He knew I was working on the show, and he’s done his own show called Daddy Issues so I asked him to be the director for Feelings. You shared a lot about your friends and family in Feelings. Have most of them seen the show? There was probably at least one person from Feelings in the audience at every show. My mom came to see it, which was really nice. Was everyone happy with your stories about them? Everyone in Feelings is represented positively, I think, because I feel positive about the people in my life. I feel comfortable with people and with any of the things that happened to me. And also, the things I talk about happened at least four years ago, so there’s a distance now. Can you talk about the various art mediums you work in? It’s very interesting because I do a lot of different things. I write, draw and do weird art projects. I used to be and still am a teacher at times. But I’m not an expert in anything, especially performing, which I kind of like. When I walk on stage, you’re not seeing someone who is a performer all the time. It’s not a perfectly polished, public face. You’re kind of seeing just a regular guy and my goal is to stand on stage and be myself as well as I can. You’re currently working on a memoir. Will it dig deeper into the material you shared in Feelings? Yes, it will be a fuller picture of that same time period in my life, weaving in other layers of the story and pieces that couldn’t fit into a 60-minute show. Will there also be art? Yes! At least as much as there was in Feelings and hopefully more. I want to include as much art as it makes sense to. You used to be a high school teacher. Do you miss teaching full time? I left teaching and then returned and left again, but I haven’t been a full-time teacher for about three years. In that time, I’ve done a lot of random things. I’ve taught a college class. I teach in the Moth’s high school program. I’m really excited about teaching an upcoming storytelling class with Electric Lit, which will be my first time with them. I’m grateful for these little bursts of teaching opportunities, because I do miss full-time teaching a lot. What do you miss about it? One of the downsides of working on writing and art is that not a lot happens. At the end of the day of teaching, I always had stories. I would experience feelings that ranged from high to low, after just one day of teaching. And I always swore I wouldn’t tell teaching stories, but now I think enough time has gone by that I can start telling them. What impact has the Fringe Festival had on you and/or your performances? Over the course of the Fringe Festival, I feel like I’ve grown so much, and more and more, I’ve realized just how much I love live performance. It feels real. Magical things can happen with writing too, but one of the magical things that can happen live is when we’re all there right then, and we can feel something in the air together. "Feelings" will be performed September 25-October 4 at the SoHo Playhouse. Michele DeBella is a freelance writer who loves traveling to far away places, but also discovering adventures close to home.